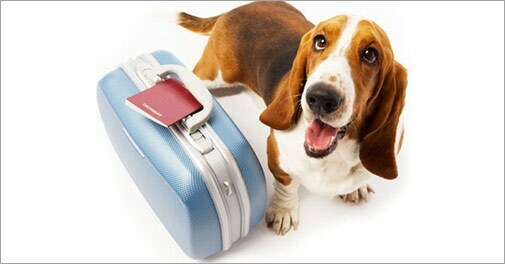 Off on an extended overseas business trip, but don't want to leave your dog behind? Some pointers on shipping your pet by air. Your dog - a furry German Shepherd - is like a child to you, and you just can't wait to be hugged by it every time you return home from work in the evening. Even holidays aren't spent without your canine mate, and your friends have started counting it as part of 'the gang'. The dog dotes on you, you dote on the dog, and things are as good as they can get. That is, until your boss calls you in one day, and announces that you will be required to go on a business trip to Switzerland for six months. If he expected you to whoop with joy, he doesn't get it. You aren't thinking of the Alps or the skiing trips or the generous mugs of hot chocolate you would be waking up to in the coming days; you're thinking about the furry friend you may be forced to leave behind. But you don't really have to, do you? Most airlines these days would be more than happy to take your pet along - as long as you adhere to these six important commandments. Assuming that the airline you have chosen allows pets onboard, check if it has any health and immunisation requirements that need to be fulfilled. Very often, a health certificate needs to be issued in this regard within 10 days of travel. Make sure your pet's certificate is up to date, and you meet all the requirements of your destination country. Make sure that your pet is wearing a collar with an ID tag, listing your home address and functional phone number as well as your cell number and the contact number of your point person at the destination. Your pet may find travelling a harrowing experience, and these precautions will help the authorities zero in on you if it should "take off". Pay a visit to your veterinarian and check if your pet is capable of extended travel. Most airlines require the animal to be at least eight weeks old, and experts say that pug nosed dogs and cats (such as boston terriers, boxers, chow chows and Pekingese) have trouble breathing during travel due to their short nasal passages. While you may think that tranquilising your pet would spare it anxiety during a long flight, veterinarians would generally advise you against it. Sedating your pet for a flight journey is not advisable, they say, because the effect on the animals at high altitudes could be quite unpredictable. But if your dog is the frisky sort and you are convinced that sedating it would work out better, discuss the specifics with your veterinarian. If your pet is going into the cargo compartment, try to book a direct, non-stop flight to ensure that it doesn't have to be transferred to another plane. It's human to err, and you don't want your pet to be cooling its heels in Siberia on account of a typographical error committed by a grumpy airport staffer who wanted to go home early. Before the flight starts, tell the captain and your flight attendant that your pet is in the cargo. That way, they will consider your pet in case of special circumstances. Also, make sure that you do not overfeed your pet just before a flight; it is not advisable to make it travel on a full stomach.